The Feather River is one of the many prime destination to fish during the fall steelhead run. As one of the main tributaries of the Sacramento River, the Feather River has one of the highest returns of salmon and steelhead in the valley. 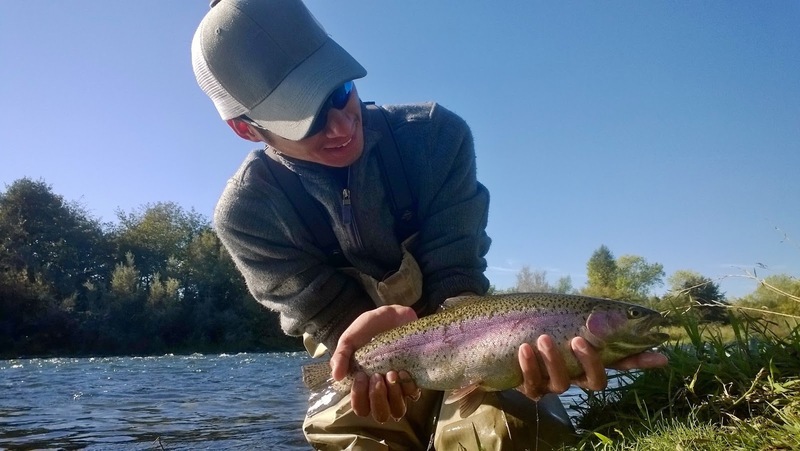 Although gear anglers don't focus on steelhead much until the stretch between the hatchery and HWY 70 bridge opens up in January, fly anglers are hot on these fall chrome domes from September to December. A lot of the steelhead action on the Feather takes place in the Low Flow section between the hatchery and outlet. The High Flow section from below the outlet to the end of the Oroville Wildlife Area is usually not very productive unless there is a strong salmon run but fish can be found there. Most of the riffles in the Oroville Wildlife Area hold steelhead but there are a few that never hold any. It takes a bit of time to figure out where the fish hold but if you watch other anglers and where they are you'll figure it out in no time. Keep in mind that the section between the hatchery and HWY 70 closes from July 15th - December 31st. No Front Fins. Must Have Made The Trip Home Several Times. Amazing! I have found that the number of fall-run steelhead that return each year to the Feather is somewhat correlated with both the amount of rain and salmon the valley gets. No rain no steelhead, no salmon no steelhead. It's a bit of a no brainer. We are well into November now and with a few good storms here and there, the salmon have arrived! 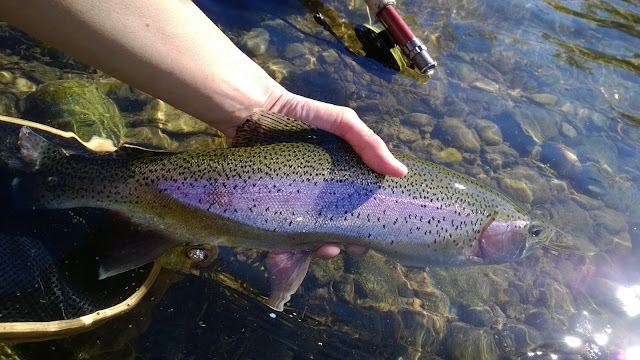 I spent two days chasing Feather River steel and overall I will admit the fishing is fair right now. The more water you cover the better chance you'll have of finding a hooking up. It felt like I made a thousand casts but I found them. Seems pretty fair to me. There are a ton of salmon in the low flow and the steelhead are right there with them. Despite the number of salmon in the river, I wasn't able to convince any steelies to eat an egg. But I did find one egg eater. 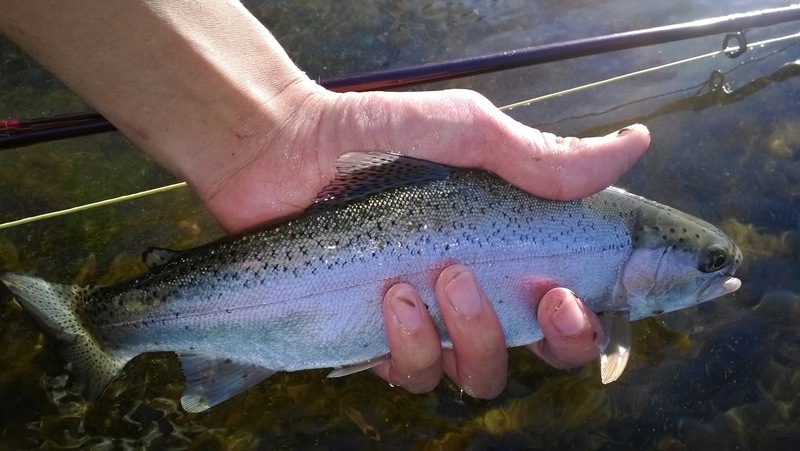 There is a lot of information online about how, where, and when to fish the Lower Feather River so instead of going into too much specific detail, here are some of my personal fly fishing tips for Feather River steelhead. 1. Use strong knots, leaders, and hooks! I rarely lose a fish to tippet breaks. Most of the time when I lose a fish its because I didn't double check my knot durability. Check your knots often. Don't use cheap flies for steelies because if you hook a big one it will bend it and spit it. Cheap flies = cheap hooks. You don't get a steelhead on the end of your line very often so make sure you're prepared. 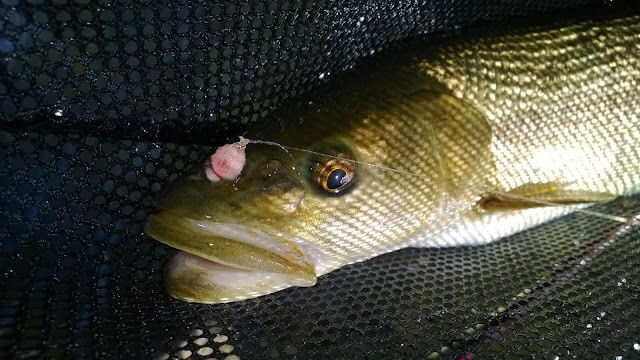 Steelies are pretty grabby if you put the right fly in their face. If you're not getting any takes its probably because you aren't using the right fly pattern. Change them out often to figure out what's working. During the spring-run, flies that imitate bugs work best. The flies I have the most confidence in are bird's nest, psycho prince, Moorish dirty birds, and copper johns. If you get lucky you can even get a steelhead on a dry. Try an EC Caddis. From what I've observed, caddis are the main food source for fish on the Feather. During the fall-run the same flies work will still work in addition to egg patterns and San Juan worms. 3. If you hook something, play it! When fishing for fall-run steelies there will usually be lot of salmon around. If you're decent at dead drifting you won't have a problem whereas it is pretty rare to hook a salmon while nymphing. The only way you're going to hook a salmon is if they spook as you are stripping in your line to recast or you hit the needle right on the head and floss them. These are hefty adult steelhead we're talking about so they will sometimes feel like a snagged salmon. However believe me when I say if you set the hook and it's headshaking, 90% of the time it won't be a salmon. You get a take but its not really running around like a crazed steelhead. You find that the fish is holding in one spot occasionally moving around a little bit, you start getting skeptical. Play it patiently and once you get it close enough check the set. 4. Fish early or late! In my experience, I usually catch more steelhead at first light to about noon. Waking up at 5am to get to the river at sunrise can be tough but it's worth it. Fishing early also allows you to hit up some of the best water before anyone else does. It also works the other way around. The later you fish the less pressure you have to deal with. There's no such thing as sloppy seconds when it comes to steelies. In my opinion, steelhead fishing is best experienced while wading. The amount of effort it takes to hike all over the river in search of that one take is what the experience is all about. Don't stick around in a run, riffle, or pool for too very long, if they are there they'll let you know. Steelhead fishing isn't a numbers game, it's more of a game of hide-and-seek. With such awesome steelie action it can get pretty crowded out on the Feather during steelhead season. I like to fish the further areas first then hike up the river to avoid driftboats and anglers that are moving downstream. 10% of anglers catch 90% of the fish. Come join the 10% club. If you are unfamiliar with the Lower Feather River, Streamtime Maps has an excellent map of the river. These are quality maps that show access points, riffles, runs, pools, etc. You can find them online or at your local fly shop.